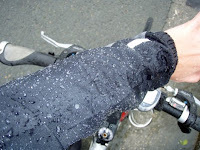 The argument about what clothing barrier will best protect a cyclist from falling precipitation while simultaneously rejecting inner condensation will go on until the end of time. I say such a garment does not exist. "A rain jacket can't keep out all rain and let out all sweat," Geoff told me once. "It goes against the laws of physics." Now, I haven't taken a physics class since I was in 11th grade. But I have owned a lot of rain jackets ... gortex, polyester, nylon, PVC. The driest by far has been the PVC - sure, it doesn't breathe, so it builds up a lot of inside moisture. But it's a tropical kind of moisture, warm and humid, and just a little bit damp - it's not the kind of frigid soaking I get once my other rain jackets give up the ghost and I'm left alone in the weather. I feel strongly about this issue so today I actually set out to blog about it. Today's subject: My Pearl Izumi Vagabond jacket. I won this jacket in the 24 Hours of Light. It's a great jacket, actually - it has zip-off sleeves, fits well, retails for about $100. And, in its defense, it is not made for extreme weather. But today did not feature extreme weather. It was rainy and windy - normal weather. This jacket was brand new on June 28. It has never been washed (I know ... ew). Here we have a picture about five minutes into the ride. See those glistening beads of water? That means the Vagabond is doing what it's supposed to, keeping the rain out. All is well, right. Right? But here we have the jacket about 1:45 into the ride. Where did all the shimmery droplets go? Could it be that they've bounced clean off? Or maybe the jacket developed an invisible force field to further repel the raindrops that are still falling from the sky. Or is it possible, just possible, that the rain has soaked through? Let's check ... roll up the sleeve. Yup, my base layer is soaked, at least as far as my elbow. Could it really be an inordinate amount of forearm sweat? At 50 degrees? Or could it be that my fairly new, $100 rain jacket is (gasp) letting in the rain? Come to think of it, I am feeling pretty soaked. Once this jacket gets pretty wet, it's no longer very wind resistant either, and I can feel the chilled breeze moving through. Luckily, I carry back-ups in my trunk bag ... Polar Fleece. It's not water resistant in the least, but at least it's still warm even when it's wet. So, my conclusion: Most rain jackets are good for 20, maybe 30 wet rides before they start breaking down. I've tried that spray-on waterproofing before, but mostly found it to be pretty short lived and not really worth the cost. The best plan when the weather is dipping into the 40s and raining: Stay warm. Wool is warm but heavy. Polar fleece is better. But PVC is best, and I usually return to it when I've come to the painful acceptance my latest "water-resistant breatheable" rain jacket just wasn't made for real rain. If you go out in the rain, you're going to get wet. Accept it. I have. I own this jacket and I like it, from what I read about it I was under the impression it was a showerproof and not a waterproof, as such I only expect it to keep rain out for maybe ten minutes. I gave up last week trying to keep the rain out and concentraed on staying warm, which worked better. I bought the Vagabond also. I read in Bicycle Magazine about how great they were. I noticed the exact same thing you wrote about. I would not buy another. When you find one that works...please let us know. Couple of pointers here. There's 2 elements (no pun intended) at work when it comes to making a waterproof fabric. One is the waterproof membrane itself and one is the DWR (durable water repellent). The membrane itself is the barrier that keeps moisture out. With a fabric like Goretex, the membrane actually has millions of little holes in it. These holes are small enough that water droplets can't get through (keeping you dry) but big enough to let water vapour out (stops you getting wet from sweating). The job of the DWR is to the repel the water so it doesn't actually get to the membrane. Some DWR treatments are better than others. What's happened with your jacket is that the DWR has become saturated allowing the base fabric to become soaked. The membrane is obviously pretty poor and so the water is now getting through. Another side effect of this is that if the fabric gets saturated it's also no longer breathable so you start to get wet from sweat. Thanks for this post Jill. It's been raining here in Atlanta for about a week. Luckily it's in the low to high 70's so I haven't had to deal with any chill. But this subject had been on my mind a lot this week and I too have accepted that I'll just get wet. Therefore I haven't added anything to my normal riding gear. Other than plastic bags for added peace of mind that my phone is safe and my work clothes are dry inside my waterproof trunk bag! Although it's never had a drop of water inside even with complete downpours. Jill, Luckily riding in Knoxville, we rarely brave the cold like you. Daily temps here all winter usually climb into the 40's. Rain is so infrequent, we do go if it is raining and if it starts while we are riding, who cares we ride. A couple of days ago i started my own blog, not sure if it is or me to vent or for my family. Any tips from the pro? I have been a fan for a little over a year now. Have you ever tried the rain-proofing you add into your wash cycle? I've always been curious if it works. Although I don't usually bike in the rain, I have several older shells that have worn out their water-proofing and would like to breath some life back into them if possible. Interesting. Please keep us posted on further testing and recommendations. Hopefully they can keep improving the two elements of waterproof fabric. But I don't care how breathable they make it or how wickable your inner layers are, if you're working hard, you're going to sweat and sweat makes you wet. Especially if you're a sweat hound like me. 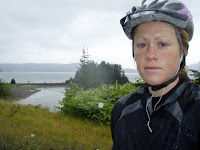 A well timed blog topic, waterproof cycling jackets, I agree with everything you wrote. 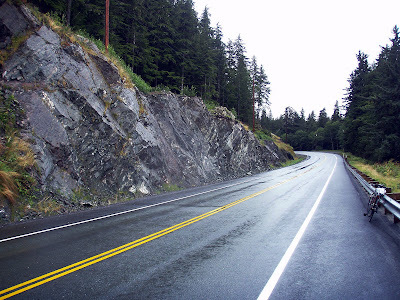 I'm moving to Burnaby, BC in a few days to go back to school and one of my immediate tasks will be to buy a new cycling jacket. I've already been scoping what's out there on the market but know my purchase will be a combo of what's available, what fits and what has the best water proofness possible for the lower mainland winter weather. I'll keep the PVC in mind....and I'm bringing a couple of wool jerseys. In a few months I'll let you know if I found something with a decent lifespan. Until then have fun riding in the rain. I know I'm going to have to learn to do so as well. Hi from Italy, I use Briko , look on briko.com page. I think your conclusion is best, that impermeable fabric, such as true rain gear like the fisherman wear will keep the rain out and body warm. If you look at pro cycling they all put on non- breathable rain jackets when it gets wet. Have you tried wearing wool? It can get wet, and still keep you warm. Companies like Ibex make great wool gear. 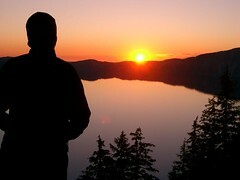 I bought a pearl izumi goretex jacket a few years ago, and the thing rocks. It was super expensive though. I think it retailed for $300, and I was lucky to get it on sale for $100. The thing definitely does not breathe at all though. I only use it when it's super cold and snowy out, or when it's pouring rain. Try wetsuit under a shell. The resistance adds to the work out too. I've given up on name brand rain gear (except for Helly Hansen PVC). It just rains too much here. I am on my third jacket this year. Once they reach the saturation point, none of mine have recovered for any rain heavier than mist. For some great rants on rain gear and outlandish manufacturer's claims, go to Jim Wigatowski (sp?) web page, wiggys.com He has some truly excellent gear, most of which has been field tested, over and over, in Alaska. I wish somebody would have told me this 5 expensive rain jackets ago. But this clears up a major pique for me. I just couldn't figure out why people walk around here with polar fleeces in the pouring rain. I use the regular sports wash on my gym stuff. Seems to do the job, but can't attest for the waterproofing. I thought the recommendation was PVC? Clump, clump, squish, squish. I'm telling you Jill... get yourself a SHOWERS PASS DOUBLE CENTURY jacket. The secrets' in the vents - they are what keep me warm and cool depending on my needs (Maine riding). When I feel the slime coming on, I just open one of the seven available vent points. Feel that chill? Zip up! Underneath - it's wool all the way. Check out vintage velos for some beautiful jerseys. "You will be snugly... just like a lamby, plus wool doesn't stink, or ever feel clammy!" I love your blog! I can't believe Fall came in mid-August! Reading your blog is better than the weather forecast ... 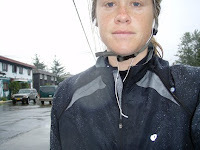 I know if you're riding (and writing) about riding in the rain, I'll be riding in the wet stuff within 2 days. We get, maybe, 50 days a year that aren't raining here in the Willamette Valley. For cyclists who want to ride through all four seasons, the preferred jacket is the Showers Pass Elite. Seriously, if you show up at a club ride on a saturday morning - 20 of 25 riders will have on the Shower's Pass Elite. God they work great ... when they are new. Like you, I try to avoid washing it, because washing them just accelerates them to their half-life, which is probably about 1 Oregon winter. I agree, that's probably something in the neighborhood of 50 -100 wet rides, or 30 washings. I wrote about my experience with the Showers Pass and you can get it here, if you are interested: http://readytoride.biz/?p=184. 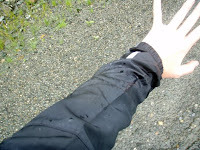 Your Pearl Izumi jacket is water resistant, not waterproof. so the first picture shows its Durable water repellent (DWR) finish doing it's job, and beading up water. The second photo shows that once the DWR can't keep up, it soaks in. and then you get wet. no great surprise. Gore-tex (or Elements, Hyvent, or Precip, to name a few) are in fact a mesh with tiny holes. these holes are small enough that water molecules can't move through, but big enough that water vapor can. this is the basic principal behind waterproof/breathable, as someone mentioned before. 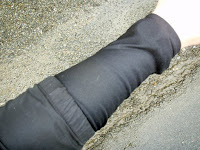 BUT here is the problem, when dirt or oil gets on the jacket, that dirt or oil becomes a conduit for moisture to run through the material anyway. So what do they do? They add a Poly Urethane (PU) coating to the back of the gore-tex. the down side of this is it dramatically decreases the very breathability we are after. And since it destroyed the breathability, they had to do something to increase breathability. That's why jackets have Pit zips. In my experience, if you want to know how breathable a jacket is, look at how big the pit zips are! And if the pockets are vented, it really needs help. Waterproof is easy. But breathable is hard. PVC (as several people mentioned) is waterproof, and in really wet environments (the gortons fisherman comes to mind) PVC, or rubber is the way to go. I'm going to add a little bit more, because A) this is what I do for a living, and can talk about it WAY too much, and B) I have had a couple of whiskeys. So, some waterproof breathable (WPB) jackets have a mesh, or ventilated fabric on the inside. you may think this is to add insulation, but it's to add space. Space between you, and the membrane. Space to allow water, heated by your body, to vaporize, so it can move out through the membrane, these jackets are usually more breathable, and breathable usually means drier. Most of the jackets that don't have this liner on the inside still try and make the space, and they do it with three dimensional printing. Marmot Precip uses microscopic 3d dots, REI elements uses 3d lines that look like topo maps. this is to provide space. I know, your saying this guy is crazy, they are just lines, but really, that's what they are supposed to do. There is something new (sort of) though, and it's called eVent. It's not really new, but let me just say Gore-tex has done a GREAT job keeping companies from using it. eVent discovered a process to stay waterproof and breathable without the PU coating. So it is waterproof, AND still breathable. I haven't had a chance to test it, but I should have an opportunity in about a month. I am cautiously optimistic. Thank you for repsonding. Very informative. I never looked into the science of water-resistant jackets before. Your post proves I would have benefited from doing some more research before trying different jackets. I wasn't trying to knock the Pearl Izumi jacket. I received it as a prize in a race, and didn't even know the name of the jacket until I looked it up yesterday. When I read the description, yes, that jacket does exactly what it was advertised to do. It doesn't bill itself as a heavy-duty rain jacket. But during the first month I used it, it worked really well even in heavy storms. It's gotten progressivly worse in a few short weeks, which has been my experience with every polyester and nylon-based jacket that I've owned. I have had people recommend eVent before, but have been reluctant to spend any more money on rain jackets when I already found something that works for me (PVC). Sweat has never been much of a problem for me, especially in the temperatures I generally ride in, so with PVC I can opt for "damp" instead of "wet," and a it's a super-cheap product that I won't mourn when I destroy it (I have ripped a couple jackets in falls) But maybe I should take the eVent leap. I believe those Showers Pass jackets use it. Hi Jill - someone may have already mentioned it but I didn't want to read all 27 entries to find out so here goes: there is a new waterproof/breathable called eVent that is supposed to smoke the competition, including gore. I've heard from early adopters that you can actually see steam rising from people who are wearing it while engaging in rigorous activity in the rain. REI is changing all their W/B items to eVent for '09. Just a thought. There's plenty of waterproof jackets that hold up to "real rain". It's pretty naive of you to think that because you've used a few products that there are no jackets out there that work. I think there are even other places on earth that get as much rain or maybe more than se Alaska. I'm going to echo Toni, David, Anon and others and re-recommend the Showers Pass. It does use the eVent fabric that Gore is trying to keep from everyone and so far mine has made it through one Portland winter. My longest day was 5 hours of bike errands all over town and I was dry when I got home. However, I know how it is when you've already spent so much money on crap that doesn't work. That's why I keep lobbying Showers Pass to send you a free Elite jacket. I think if it worked for you, it could mean some good publicity and street cred for them. I live in the pacific Northwest -- it cannot compare, rain-wise, to Alaska, but the weather here does try. I have tried pretty much everything (including just suffering under a truly waterproof shell). The only jacket that I found to work on my long tours -- "long" in the sense of multi-day, with relentless rain bugging me -- is the Showers Pass Elite 2.0. They have cheaper ones (the 2.0 was $220), but this one is the only one not giving the marketing hype the lie. Another commenter already noted the strategic vents and zippers, including two underarm zippers; I'll just add that the jacket has provision for attaching an (optional) hood from the same material. Oh, and here is a candidate for the Hall Of Shame: Under Armour makes a Goretex running jacket -- and then embroiders the UA logo onto it. Why not just sew a funnel through the fabric? "BUT here is the problem, when dirt or oil gets on the jacket, that dirt or oil becomes a conduit for moisture to run through the material anyway." I suggest you trying washing it. It won't be as good as new but it may improve lots. When either our gortex (Bernoulli jackets from Mountain Equipment coop, no longer available) or our water resistant jackets (Microft, same source and still available) stop working, I wash them and dry them "hot" and they start working again. You should check the washing directions but if it says dry them "hot" don't skip this step. They same the same thing in Poland: You're not made of sugar.